Megger... the Pioneer of Insulation Testing. For over 100 years, Megger has been the leader in insulation testing. The MIT400/2 series has been proven to perform in the “renewable energy” industry. The MIT400/2 series has been used successfully in both wind and solar applications, from generators and cables to combiner boxes. Find pinched wires and leakage problems before they become dangerous with the Megger line of MIT400/2 series Insulation testers. SOLAR POWER WORLD does not pass judgment on subjects of controversy nor enter into disputes with or between any individuals or organizations. SOLAR POWER WORLD is also an independent forum for the expression of opinions relevant to industry issues. Letters to the editor and by-lined articles express the views of the author and not necessarily of the publisher or publication. Every effort is made to provide accurate information. However, the publisher assumes no responsibility for accuracy of submitted advertising and editorial information. Non-commissioned articles and news releases cannot be acknowledged. Unsolicited materials cannot be returned nor will this organization assume responsibility for their care. SOLAR POWER WORLD does not endorse any products, programs, or services of advertisers or editorial contributors. 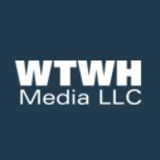 Copyright©2019 by WTWH Media, LLC. No part of this publication may be reproduced in any form or by any means, electronic or mechanical, or by recording, or by any information storage or retrieval systems, without written permission from the publisher. SUBSCRIPTION RATES: Free and controlled circulation to qualified subscribers. Non-qualified persons may subscribe at the following rates: U.S. and possessions, 1 year: $125; 2 years: $200; 3 years $275; Canadian and foreign, 1 year: $195; only U.S. funds are accepted. Single copies $15. Subscriptions are prepaid by check or money orders only. 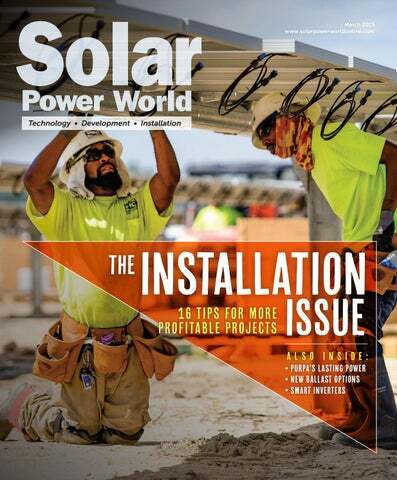 SUBSCRIBER SERVICES: To order a subscription or change your address, please visit our web site at www.solarpowerworldonline.com SOLAR POWER WORLD (ISSN 2164-7135) is published by WTWH Media, LLC, 1111 Superior Avenue, Suite 2600, Cleveland, OH 44114. SIMPLE SEAL SYSTEMS FOR DIFFICULT ROOF PENETRATIONS E-CURB® & CHEMCURB® PENETRATION SEAL SYSTEMS Chem Link’s curb systems are ideal flashing systems for solar racking standoffs because they are efficient and easy to install, regardless of the installers skill set. Curb systems are superior to other penetration seal systems that are notorious for corroding, are labor intensive and do not offer configuration flexibility. This system will save installers time and labor, leading to cost savings. Superior module efficiency. Maximum power production. Offer top-rated solar quality and turn your customers into your biggest advocates. HIT® high efficiency modules provide one of the world’s lowest temperature coefficients and degradation rates. Homeowners will produce more clean electricity year after year while you maximize every roof, every installation, and every relationship. Let’s take your business to profitable new levels together. Boston, Massachusetts The Massachusetts Department of Public Utilities approved a new three-year energy efficiency plan that included a first-of-itskind policy that makes behind-the-meter batteries eligible for incentives, according to the Clean Energy Group. The state will pay out the incentive at the end of the year to residential and commercial storage owners based on how much they reduced their load during peak demand times. Boise, Idaho A bill working through the Idaho legislature would prohibit homeowners associations from banning solar panels unless the installation violates building code or safety requirements, according to the Idaho State Journal. Without such legislation, HOAs often refuse solar panels for “aesthetic” reasons. Springfield, Illinois New legislation called the Path to 100 Act would expand Illinois’s renewable energy standards to require 40% renewables by 2030, with a goal of eventually reaching 100% clean energy. The state is already behind on its current goal of 16% renewables by 2020, but this act would generate funding to accelerate growth. New fossil fuel plant development could sabotage New Jersey’s clean energy goals Trenton, New Jersey A coalition of environmental groups called Empower NJ found that if the 12 proposed fossil fuel plants in New Jersey come to fruition, they would prevent the state from reaching its goal of 100% renewable energy by 2050. Empower NJ calls for a moratorium on new fossil fuel infrastructure until the state develops standards to reach Governor Phil Murphy’s clean energy goals. Harrisburg, Pennsylvania Pennsylvania’s bipartisan HB531 would allow for community solar development in the state. The Pennsylvania CapitalStar reports that the bill is backed by a diverse group of lawmakers across the state. Vote Solar found that if Pennsylvania added 500 MW of community solar, it would see a 26% increase in solar jobs and $706.4 million in local economic benefits. Frankfort, Kentucky Utilities and solar companies continue sparring over a net-metering bill in Kentucky that would allow the PSC to set the rates at which utilities compensate residents, according to the Miami Herald. The Senate voted down the latest version that added some protections for the solar industry and solar customers. Solar advocates had been in favor of the amendment even though they believed the bill still had problems, according to WFPL. Jefferson City, Missouri Ameren Missouri announced a plan for its largest infrastructure upgrade in history in order to make the shift to a smart grid. Ameren’s president said the upgrade will make the grid more reliable and resilient and able to accommodate more renewable energy. The plan calls for $5.3 billion in infrastructure improvement projects statewide over the next five years. Los Angeles, California The Mayor of Los Angeles announced the city was scrapping plans to rebuild three natural gas plants and instead investing in clean energy like solar and storage, according to the LA Times. Environmental advocacy groups argued that putting money into fossil fuel plants would hinder the city’s ability to reach its goal of net zero carbon by 2050. Columbus, Ohio A poll by the Republican polling firm Public Opinion Strategies found conservative voters across Ohio overwhelmingly support public policies that encourage renewable energy growth. The voters view renewable energy as a job creator, and 82% indicated they also support netmetering incentives for homeowners. Sante Fe, New Mexico The Community Solar Act in New Mexico would allow for the development of community solar projects in the state. GRID Alternatives says the legislation “sets a new bar for equitable community solar policy” by specifically including Indian nations, tribes and pueblos in the bill’s language. Solar collectors installed in the 1970s on a building on the Lower East Side of New York City played a pivotal role in the passing of the Public Utilities Regulation Policies Act. Charlie Copeland, P.E. from outside facilities keeps sneaking in. Utilities have continued pushing for amendments to PURPA at state levels, trying to limit their requirements to buy more solar. For example, the three investor-owned utilities in Arizona have filed petitions within the last three years to amend PURPA and limit contracts with QFs exceeding 100 kW outputs to two years at most. A hearing will likely be held on the issue sometime in 2019. PURPA is different from Renewable Portfolio Standards, which mandates utilities operating in certain states to purchase a certain percentage of renewable energy. Instead of an obligation, PURPA was meant to introduce competition into the energy market, Glass said. “We — the solar industry in particular — are very comfortable with competing,” he said. “We just want to be able to compete fairly with the utilities and the others in the industry, because we think we can create some of the lowest-cost power. Problem is, if you defeat PURPA, you’re left with these vertically integrated utilities that will discriminate against smaller solar projects. They won’t buy it. They don’t want to. That’s what’s playing out right now, because wind and solar is now cheaper than coal, nuclear and natural gas generation. If it’s required, utilities prefer building solar themselves and profiting, rather than buying it from other smaller developers. at least one electrician to be present during an install, and some states also set ratios for the number of unlicensed installers to each licensed electrician. In Minnesota, for example, a journey- or masterlevel electrician must perform all electrical work on a PV system, and the worksite must adhere to a ratio of one licensed electrician to every two unlicensed. Such requirements can make the hiring process take longer and slow installations. Solar companies are competing with other industries for experienced electricians, and they often end up hiring from out of state. In the latest census, 22% of companies ranked electricians as the most difficult position to fill. (In Minnesota, this figure was 43%.) From an electrician’s point of view, solar installations are difficult jobs that require outdoor work and exposure to the elements. The boom and bust “solar coaster” cycle also dissuades some electricians from entering the industry. “electrician school” for solar workers. Such training programs can also create new advancement opportunities for nonelectricians. The Soltection RJ-1 rooftop junction box with flashing provides a safe, secure, and NEMA 4X watertight solution for the solar installer to penetrate the roof for attic runs and make the proper wire connections. The product is designed to be simple to install, and minimize time on the roof, while additionally providing higher levels of protection for the point of penetration in the roof as well as electrical connections inside the junction box. intake form and providing documentation that they’ve completed different requirements to make solar power more attainable for communities — including simplifying permitting; easing planning, zoning and development regulations; establishing solar rights ordinances or easements and five other criteria. Over 200 communities across the country have received SolSmart designations since the program’s inception in 2016, so the program is on track to reach its 300-community goal by the time the initial grant funding ends in October 2020. Cities have solar barriers for many different reasons, but a major roadblock is limited resources. Local governments have to prioritize important daily duties like trash removal, street maintenance or snow plowing, and solar isn't seen as a priority. the goal is really to reduce the turnaround time that it takes to get a permit and an inspection done for solar energy. about going solar in their jurisdiction. She supplies the city with a template for an online solar landing page where residents can find everything they need to know about going solar in that town, including financing options and lists of solar installers in the area. Barenholtz said the solar installers she's spoken to have been thrilled with the results from South Florida's SolSmart efforts. Justin Hoysradt, CEO and president of West Palm Beachbased residential installer Vinyasun, said SolSmart helped the company expand its business and provide affordable rates to customers. "Prior to SolSmart, there were extremely long wait times for permits — anywhere from 60 days on up to 90 days in some municipalities that we've worked," Hoysradt said. solsmart criteria The eight objective SolSmart criteria. Communities that receive enough points can be designated as SolSmart Bronze, Silver or Gold. Source: SolSmart.org PERMITTING Implement permitting best practices to provide solar developers and installers a transparent, efficient and cost-effective approval processes that also protects your community’s valuable staff time. PLANNING, ZONING AND DEVELOPMENT REGULATIONS Provide maximum siting options for rooftop and ground-mounted solar projects while preserving your community’s character and historic resources. INSPECTION Protect public health and safety while ensuring compliance with state and local codes. CONSTRUCTION CODES Adopt applicable codes and standards that provide clear guidance on solar installation requirements and solar-ready construction. SOLAR RIGHTS Protect the right to sunlight for current and future solar consumers through solar access ordinances or easements. UTILITY ENGAGEMENT Discuss and implement your community’s goals for solar energy, community solar, net metering and interconnection with local utility. COMMUNITY ENGAGEMENT Support local solar energy development through public education and engagement efforts, group purchase programs and participation in state-level solar conversations. MARKET DEVELOPMENT AND FINANCE Lead the way with solar installations on public facilities and grow the local solar market by providing information on, or expanding, local financing options and incentives. Saffron is a crocus generally harvested in arid climates. The spice is historically grown in the Middle East, Italy and Spain, but was also harvested in the United Kingdom and grown by the Pennsylvania Dutch in the 1600s. Saffron is a late-season crop, blooming well into autumn in the United States. “Our hope is that we can show that the land is still agriculture and we can create a viable crop and bring a The test bed of saffron in front of market and be able to say, ‘No, the solar array at Gervais Family this has not taken the land out Farm begins to bloom. Peck Solar of agricultural use,’” Yates said. “It’s keeping agriculture in use, in fact. We can double the value of this land to the farmer.” The soil that saffron bulbs are planted in can be walked on, allowing for easy array maintenance when not in bloom; and shallow-rooted crops can be planted above saffron during the off season. In 2011, we sought out to invent a mounting system that seals penetrations on Asphalt Roofs without lifting Shingles. We received a patent and now, 7 years later, the product has finally gained acceptance as the world’s 1ST UL Certified Microflashing® and a ground-breaking way to mount solar on top of asphalt. That product name is: QuickBOLT. The new name of our Solar Division is: QuickBOLT. proprietary grid of interconnects. The grid lends stability to the brittle silicon cells and eliminates failures associated with busbar soldering points. The grid’s unique design enables Merlin to eliminate thermomechanical stresses that are endemic to crystalline solar technology — allowing for flexible panels when encased in polymers and lightweight, frameless panels when using thin glass. Founder and CTO Venkatesan Murali, Ph.D., said that Merlin’s use of conventional crystalline silicon solar cells in rugged, flexible and lightweight panels has piqued the interest of solar installers looking for alternatives to traditional, framed modules and problematic flexible thin-film. By focusing initially on other, technically more challenging markets, we have been able to refine our product’s performance, reliability and aesthetics. finished the development, we came up with something that addressed the major problems with silicon: cell cracking and interconnection failures. We changed from thinking of connecting solar cells with wires and busbars, replacing it with an interconnect that adapted to the cell characteristics.” Merlin’s grids, which are manufactured in a facility in Thailand, allow more than 2,000 contact points with the cell, moving current more efficiently and boosting generation in low light and scattered light conditions. The company has panel manufacturing factories in California and the Philippines. The company also has a contract with manufacturing partner Waaree Energies in India, which has a manufacturing capacity of 1.5 GW a year. Merlin Solar is focusing on the U.S. market but also has a major presence in Southeast Asia and Europe. Murali said the startup company is here to stay. “We’re one of the only companies that have crossed the chasm of R&D to manufacturing. We were not looking for transactional or immediate sales. We take the long view and instead focused on creating design wins with strategic partners,” he said. Smart inverters redefine relationship between DERs and the grid Inverters of the past simply fed solar power into the grid. Inverters of the future are required to instead dynamically work with the grid to increase its resilience, reliability, safety and security. ‘Smart inverters’ are a more sophisticated version of power electronics that can make autonomous decisions to keep the grid stable and reliable as more distributed energy resources come online. Instead of just feeding power into the grid, smart inverters are capable of having twoway communication with it. Thanks to advanced software, smart inverters can perform specific gridsupportive functionalities related to voltage, frequency, communications and controls, according to IREC's "Primer on Adopting the New IEEE 1547TM-2018 Standard for Distributed Energy Resources." "The primary difference is that smart inverters are programmed to respond to the grid in an automated way such that they not only react when the grid shuts down, but also provide grid supportive functionalities," said Sara Baldwin, VP of regulatory at IREC. She said the transition to smart inverters is like moving from flip phone to smartphone. Inverters without these smarts simply shut down after sensing any grid disturbance — a voltage or frequency fluctuation — even if that fluctuation was small and inconsequential. "The reason why that's bad is that it causes this sort of whipsaw effect on the power grid where a small disturbance that causes the inverters to trip off can actually make the problem worse in terms of creating more grid disturbance," said Tom Tansy, chairman of the SunSpec Alliance, a group that helped to develop the updated IEEE standard. smart inverters are programmed to respond to the grid in an automated way... [And] provide grid supportive functionalities. The key to a stable grid is consistent voltage and frequency. Too many tripping inverters on the grid causes instabilities like voltage fluctuations that lead to blackouts or brownouts. An everyday example of the effects of voltage fluctuation is when you turn on a highvoltage appliance, like a vacuum, and the lights in your home flicker. To avoid harmful voltage fluctuations to the grid due to solar power, smart inverters can ride-through small disturbances (for example, voltage changes), meaning they can switch into standby mode and observe how long the disturbance takes place, then turn off only if the disturbance lasts too long. "If it takes place longer than the specified time, then yes it'll turn off. But if the grid corrects itself in the intervening time frame, it'll just keep on going," Tansy said. The proliferation of smart inverters could expand the possible size of the solar market in a big way. Individual distributed energy resources (DERs) will now come equipped with grid-support functionality, so they will be more of an asset to the grid than a burden. “They're enabling us to go beyond what was previously conceived to be limits and enabling states to do what California is aiming at doing, which is 100% clean energy," said Glenna Wiseman, director of the SunSpec Alliance. Along with communicating with the grid, smart inverters also communicate with the different parts of an individual array. Smart inverters use data communication to comply with Rule 21 rapid shutdown requirements. The communication between the inverter and the rest of the system along the DC power lines allows fire personnel to easily de-energize a home's solar system in case of an emergency. The standard The 2018 update of the IEEE Standard 1547 was released last April, with the full rollout set for 2022. But most manufacturers have been developing smart inverters since the introduction of Rule 21 in 2017, said Tansy. A few examples of smart inverter manufacturers are ABB, SMA, Fronius and Delta. Early adopter solar states California and Hawaii also initiated smart inverter requirements even before the IEEE required it because of the large amount of DERs already feeding into their utility grids. State regulators will be in charge of implementing the new standard at the state level, in conjunction with utilities that will integrate the standards into interconnection protocols, according to IREC. The solar industry, technology manufacturers, state and federal agencies as well as national laboratories and advocates will also help with the transition to smart inverters. Baldwin said the issue of legacy systems built with older inverters is a frequent topic of conversations around the updated standard. She doesn’t think these systems will be a problem in most markets, and expects that older inverters will only be swapped for smart inverters when it comes time for replacement. “However, as the functions of the new inverters are adopted and as they roll out more widely in the system, there may be situations that require older inverters to be either swapped out more quickly or to give an incentive to folks to swap them out, but I am not seeing that happen yet,” Baldwin said. Aggregating systems using smart inverters and advanced communication technology would create a more predictable and controllable fleet of DERs and enable the smooth transition to a smart grid with as many solar systems connected as possible. The one downside to these advanced inverter communications is increased cybersecurity risk. Tansy said the U.S. power grid is evolving from a relatively small Datacom network with few points on the grid where it could be attacked — also known as the attack surface — to one where every distributed energy source is communicating with the grid. This greatly increases the size of the network and the size of the attack surface. SunSpec is working with Sandia National Laboratories on standards to ensure that cybersecurity risk is minimized as inverters and the grid get smarter. SOLAR PANEL RAPID SHUTDOWN SOLUTION COMPLETE SAFETY. LOW COST. PEACE OF MIND. The FireRaptor is an innovative solar panel rapid shutdown solution which takes your safety seriously. Offering three ways to shut down your solar panels to ZERO volts and a TWENTY YEAR WARRANTY, the FireRaptor is the most efficient solution, easy to install and operate, and fully compliant with NEC2017. Concrete installations Like land, no roof is made precisely flat. Rooftops are built with a slight grade so water can drain to avoiding settling, which could damage the structure. When installing solar on larger “flat” roof facilities, limiting penetrations is key to further prevent water damage from leaks. Roof ballast racks are built for these types of projects. The low-to-the-floor, often single-module mounts used on rooftops with slopes between 1 and 3° can be installed without a single penetration through proper weight distribution. If the roof is in the 4 to 7° range, some penetrations and attachments are likely required, and anything above that is considered sloped or pitched. PV K I T ™ 2 . 0 IMPROVED DESIGN. EASIER TO INSTALL. S-5!® has introduced a new and improved PV Kit, boasting lower installation time and cost for PV flush-mounting. The kit comes preassembled with both MidGrab and EdgeGrab for easier and more efficient installation. A single tool drives the top bolt, eliminating several installation steps. The PV Kit 2.0 features more aggressive bonding teeth for better grounding. Fewer lugs/ground wires required. these projects, because a lot of the job is simply placing concrete blocks on the foot of the racking. Installing racking to a groundmount ballast primarily follows the same steps as a ground screw or driven pile, but each manufacturer’s product can have slightly different requirements to adapt to ballasts. Concrete alternatives The industry standard for ballast weights has been precast or poured concrete blocks, but AP Alternatives, a mounting and racking specialist, has introduced an open option for ballasting. SMARTER, FASTER, SAFER, STRONGER Now you can test multiple wired strings in parallel up to 1500V / 40A with the groundbreaking new Solar Utility Pro string checker. Save time and money where it matters... in the field. SMARTER... test parallel wired strings up to 1500V / 40A - so no more separating strings to keep within the limits of other instruments – ideal for today’s powerful PV installations. FASTER... maximize the time you spend in the field by recording up to 999 full sets of string data – to complete testing without downloading and clearing the memory. SAFER... the highest rated PV tester on the market, the ability to test across multiple strings reduces the risk of accidental damage to the instrument and the user. STRONGER... the rugged case design provides more protection against damage while being transported around large utility scale sites, wherever they are. this system,” said Josh Von Deylen, CEO of APA. “This is basically a system that can be completely unassembled and recycled and reused, versus actually pouring new concrete in place.” Von Deylen said quarry rock is extracted in enough places that it’s likely within proximity of a worksite. Mining companies have slag, or “junk rock,” that is cheaper than standard quarry rock and will work in Geoballast baskets. The rock can be dumped in a pile on a worksite and set in baskets with a skid steer. “Rock is from every corner of the world, and wherever you pull the rock from it’s going to be native to that area. As far as freeze, thaw — it’s been underneath that ground right there way longer than we have been up here,” he said. “This is simply digging all-natural rock out of the ground and putting all-natural rock in a basket.” The Geoballast is compatible exclusively with APA’s Advanced Modular and Ready Rack systems. Another recently developed ballast solution integrates Yotta Solar’s SolarLEAF battery into PanelClaw’s racking system. The approximately 36-lb., 1-kWh lithium-ion battery is set in the center of the racking — not on the feet — where a panel will be installed atop it. wind talk Podcasts interview the industry’s biggest newsmakers and allow them to tell their stories. contractors corner Podcasts feature solar contractors from around the country. See how others are doing business and get ideas to implement into your own. Solar Power World’s flagship podcast series, gives you the opportunity to hear from the industry’s biggest newsmakers in their own words. Oversize your solar panels, inverters and batteries and you’ll waste money. Undersize your system and you’ll compromise battery life or run out of power — particularly on cloudy days. But if you find the "Goldilocks zone" of ample battery capacity, your solar-plusstorage project will work seamlessly. By sizing your system using the ROI method — Reduce electrical demand; Observe power draw and calculate amp-hour requirements; and Incorporate a safety buffer (reserve capacity) — you can ensure the best combination of solar and storage will be used to fulfill your energy needs. Step 1: Reduce electrical demand Sizing a system without reducing demand is like heating a home in the winter while leaving the front door open. It may be possible, but it isn’t efficient or affordable. In other words: By lowering your power needs, you can install smaller batteries and fewer solar panels. First, tackle low-hanging fruit. Swap out incandescent lighting and power-guzzling appliances and electronics for ENERGY STAR models. Eliminate vampire loads with switchable or smart power strips. Set programmable and smart thermostats lower in winter and higher in summer. Next, perform an energy audit to identify areas to improve your building’s efficiency. An important task is to seal and insulate. In North America, nearly half of household energy is used to heat and cool spaces. Reducing air infiltration and insulating attics, basements and walls minimizes thermal losses — and slashes energy consumption. ENERGIZING THE SOLAR STORAGE NEEDS OF TOMORROW. We don’t just manufacture batteries - we innovate, engineer and develop energy solutions. At Trojan Battery Company, we’re charging forward. Learn more about Trojan’s products including our new Lithium Ion solutions for renewable energy applications. during startup. They will not work unless there’s ample surge capacity. The many different battery chemistries vary in surge capacity. Lead-acid batteries have the highest surge capacity while lithium-ion systems are much lower, often below the threshold for air-conditioning startup. More lithium-ion batteries may be needed to meet electricity needs when compared with lead-acid. Depth of discharge (DOD) refers to how deeply a battery can discharge, or drain, without compromising longevity. A battery labeled as 80% DOD battery means only 20% of capacity will remain. Some manufacturers size batteries for 100% DOD — the battery equivalent of running on fumes. But be wary — a high DOD can leave you stranded. A high DOD means there is nearly zero reserve electricity for those startup loads, large appliances or days with decreased solar generation. High DOD can shorten battery life. With over 400 attendees, 48 exhibitors, and a robust schedule highlighting solar, energy storage, policy and trends impacting the Lone Star State. Join over 70 exhibitors and 1,500 attendees during this interactive event which features a full slate of education alongside exhibitor-led interactive training seminars for installers, contractors and developers. Podcast Alert! Listen to this and other Contractors Corner podcasts on your favorite podcast app. 16 tips for more profitable projects We've seen the haphazard project photos and heard the horror stories. Untrained installers have thrown together some sketchy solar projects. As an industry, we have to combat this and encourage customers to turn toward well-trained installers instead. Solarspecific training and certification is a great way to stay current on best practices, and we're big proponents of NABCEP's accreditation process. We know how much work it is to keep your NABCEP certification valid, and the industry is better for it. For those of you who didn't get to attend the 2019 NABCEP Continuing Education Conference, over the next few pages we feature 16 installation tips from technical trainers at the event. From residential to utility and storage to software, we could all use a refresher on the basics and an intro to new ideas. We hope these tips will help you install better projects in this next year and build customer trust and your own confidence along the way. Crimp DC connections correctly to avoid unnecessary downtime Ginlong Solis has seen multiple issues with DC inputs to its inverters. In the past, we have taken responsibility for DC issues that our inverters reported by providing RMAs, performing firmware upgrades, changing out internal components and more. One particular customer was having problems regardless of how we attempted to resolve this issue. We performed all of the above and exhausted our remote troubleshooting efforts. At that point, we dispatched a technician to the site to determine the cause of the issues. The customer reported that the inverter had multiple arc faults throughout the day and then it would have some level of underproduction, but the client never investigated the roof thoroughly. Upon our arrival, we found that the DC connectors on the home runs on the roof were melting. All of the controllers are set with the same charging profile. A common battery voltage sense is connected to each controller. A battery remote temperature sensor (RTS) is used with every controller. of power lost above 77° F is directly correlated with a module’s temperature coefficient. The lower the temperature coefficient number, the better that module will perform as temperatures increase. This is important in all regions, not just hot climates. When the sun is shining, rooftop temperatures can easily exceed 77° F even with ambient temperatures below 50° F.
Warranty Quantifying the value of a solar panel's warranty is sometimes difficult. The company standing behind a long-term warranty should be the first point of scrutiny. Just because a company offers a 25-year warranty doesn't guarantee it will be around to honor it. For a minimum 25-year investment, installers and homeowners should choose a manufacturer that is financially healthy, stable and brings a longstanding reputation for product quality and customer service. The approximate state of charge at various specific gravities at 25° C (77° F). significantly increase the number of modules that can fit in a given area. Solve quality issues to improve installation business According to our internal data, over 30% of solar installations are quality deficient. Process improvement experts believe this leads up to 40% of capital outlays in contractor and construction businesses to wind up as waste. As the solar industry continues to mature, quality issues once overlooked could soon be the difference between success or failure. While the idea of taking on quality issues may seem daunting for already overworked operations managers, small, incremental efforts can add up to a big difference. •	Step 1: Documentation and discovery The first step on your journey should be to document your business processes. Process maps are an extremely useful tool to document existing processes. As you discuss your company's internal workings with your team, you might be surprised to immediately discover low-hanging fruit ripe for improvement. Step 2: Prioritization To get the most out of your investment in quality, prioritization is key. "Cost of poor quality" calculators like Sustainabilist's SunKaizen widget are a helpful way to identify which process errors are costing your business the most. Pareto charts provide a valuable way to rank and visualize how your improvement efforts create compounding results. Step 3: Root cause analysis Next, identify what’s causing your quality problems. Root cause analysis tools like the Ishikawa diagram and the "5 whys" can help structure your brainstorming. These tools allow you to dig deeper to discover what’s really causing a problem. to reduce maintenance time and optimization to increase energy yields, MLPE bring the option of adding more features as needed. When installed according to manufacturer guidelines, the standard practice of shutting down AC power to PV systems prior to safety and maintenance activity on arrays does not change with MLPE. When MLPE equipment and inverters receive AC power from the same breaker and that breaker is shut down, MLPE drop the outputs of all module leads to ensure the array remains below code-specified voltage limits within 30 seconds. In addition to this automatic shutdown function under AC loss, some MLPE also provide manual activation of rapid shutdown features specifically for maintenance purposes. reDesigned Leading solar contractors use Aurora software to design and sell better solar. We rebuilt our CAD engine from the ground up to help you focus on what matters most: satisfying customers. reDesigned for Simplicity Design your residential and commercial projects with ease in our newly streamlined platform. reDesigned for Speed Fill commercial roofs with megawatts of modules in under 10 seconds. Check the estimated production immediately. reDesigned for Scale Manipulate multi-megawatt systems in real time, designing projects up to 15 MW effortlessly.